The important selection criteria for the suitable 3D camera are: the required image quality required for the 3D application, speed, the desired form factor, and cost. 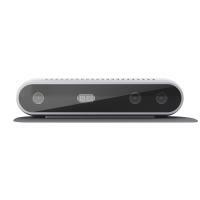 FRAMOS Technologies Inc. offers 3D cameras from the Intel® RealSense™ line, modular solutions, and custom 3D systems. Our in-house expertise allows us to provide you with comprehensive support in the selection, development, or the implementation of 3D projects. We supply tracking modules, and both middleware and software like the Intel RealSense SDK, to facilitate the simple development of innovative and intelligent 3D systems. Different 3D camera variants are available as standard products, or as custom systems. Our FRAMOS application engineers will advise you about the right 3D camera, and the suitable components and accessories, for embedded vision and seamless integration into your application. We are your partner to provide technical support and engineering services from camera selection, to developing and implementing a new specific application.